"I love you, Martha... boundlessly." Rainer Werner Fassbinder, among a trio of influential German directors to come out of the late 1960s (including Werner Herzog and Wim Wenders), created distinct cinema. His films are ultimately about power, whether social, sexual, psychological or all of the above. His characters are detached in an almost Brechtian fashion, forcing the audience to look past the pain seen on screen and to examine the underlying themes and explorations. As Martha can attest, this can be a taxing experience. 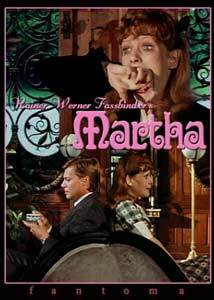 Martha (Margit Carstensen) has been controlled all her life. One way or another, she has been the subject of another party, whether it be her dominating parents or later, her cruel spouse. She seems to find an odd sense of comfort in such a place, almost as if she craves such abuse and confinement, though she seems to protest. Men pursue her relentlessly, offering their hand in marriage and following her on the street. She either gladly ignores their affections, or is simply unsure what to do with them. Such an attitude may stem from an over-sheltered past, or sheer immaturity. When her father dies in Rome, after which she cries only when her purse is stolen, Martha is left to tend to her alcoholic mother. Life is radically different, yet Martha exudes a sense of excitement. In Italy, she sees her future love and agony: Helmut. Stunningly represented by a complex 720 degree camera move, it is love at first sight, though they won't exchange words until a later chance meeting. This first conversation takes a sudden, sadistic turn as Helmut begins his cycle of subjugation through both words and deeds. Somehow, Martha cannot resist his "charms," and the two are promptly married. From here on out, every moment of marital bliss is met by infinite torture. Through sly, yet outright obvious manipulation, Helmut slowly breaks Martha down until she is a mindless servant to his excessive demands. He controls every aspect of her life, from the music she listens to, to the style of her hair. Martha continually justifies his actions, seeing them as expressions of love. Each scene builds on the next, creating an excruciatingly long, drawn out depiction of one woman's destruction. Fassbinder is certainly hitting on many topics in this Sirk-esque treatment of bourgeoisie marriage (indicated with sheer subtlety by Martha's place of residence on Douglas Sirk Street). Characters are a mere means for exploring serious issues. We should feel more angry and bitter about the dark, sadistic actions against Martha, but there is an ever-present distance between action and character that forces us to look at the issue that is revealed by the act. Unlike Blier's Un deux trois soleil, this almost misogynistic tone is not treated as normal or acceptable; clearly, Fassbinder is telling us this is wrong. This does not help make the experience tolerable. Enshrouded in a soap opera-like melodrama, Martha's sufferings are seemingly commenting on the possible extremes of relationships, namely, marriage. Helmut's sadistic acts, such as violently making love to Martha as she is recovering from a severe, full-body sunburn (which he indirectly caused), are an unflinching set of extremes, perhaps representing the stereotype of male dominance within what should be a mutual relationship between equal partners. Admittedly, I could be missing the point. Fassbinder offers no concrete explanation for the torture he puts his characters, and us, through. The visuals give the impression of a sunny Sirk escapade, but become as shadowy as noir when Helmut strikes, even within the bright rays of daylight. Performances are appropriately detached, but I was unable to get into the flow of the film, which is slow and torturous. The same, abusive point is made over and over again, without resolution. One redeeming quality is certainly Michael Ballhaus' exquisite camera movement, which enhances the emotions and issues presented, creating a more engaging film. Fassbinder doesn't seem too concerned with entertaining or making the audience comfortable, and justifiably so, considering his subject matter, but how much of this can a viewer take? Martha requires you to look below the glitzy surface to the underlying corruption, and to sort it out before you are consumed; Easier said than done. Image Transfer Review: Fantoma's 1.33:1 image looks good, considering the age of the film. Originally produced for German television, the elements may not have been as carefully preserved as a feature film, but the image shows good detail, solid colors and good contrast. However, there is persistent, fine grain throughout and an overall softness to the image. Audio Transfer Review: The German mono audio is acceptable, with minimal hiss. Dialogue is front and center, exhibiting good clarity and fidelity. Extras Review: Fantoma has included a feature-length documentary entitled Fassbinder in Hollywood (57m:02s), featuring interviews with some of his closest colleagues. The director passed away in 1982 from a drug overdose, so some of the piece is spent on memories. Those offering comments include director Ulli Lommel, Wim Wenders and Michael Ballhaus, who speaks fondly of the aforementioned tracking shot he first attempted on Martha. Some of the visuals here range from clever to sloppy, but this is an informative ride that even covers Fassbinder's stage work. The documentary is divided into nine chapters. There is also an insert with an essay by Jonathan Rosenbaum, who discusses Fassbinder's affinity for Douglas Sirk, his thematic motivations, criticisms of the film, and even a suggestion that this is ultimately an over-the-top, dark comedy. Fantoma has brought to American audiences one of Fassbinder's lesser known works. Continuing his tradition of power-motivated tales, Martha is a brutal tour of sadistic marriage behind a veneer of Sirk glitz. Frankly, I was more disturbed than compelled. Proceed at your own risk.